Thanks to Jill, who asked me recently about research and where she can find various stuff to do with hospital treatment and accents. The internet, I think, was made especially for screenwriters: Google is God. In fact, this was the inspiration for my Research or Die series last summer – anyone interested will find links to useful sites on stuff like language, events, disasters, heroes, villains, times, medical, crime, money right there… In fact, if an obvious thing/person/ isn’t there, let me know – better still, send me the link and I’ll add it. Check out the entire series here. Thee’s no doubt getting your facts right aids stories… There’s nothing worse than seeing something *completely wrong* in a story — it takes you right out of it, even destroys the read or watch at times. I got a script on a blind read recently for a company that had a young girl give birth to a baby, then run UP four flights of stairs. WTF? As any mother knows, you ain’t going nowhere after giving birth. As a result, I just couldn’t believe in it. Yet — CHILDREN OF MEN of course had a young mother doing exactly this. 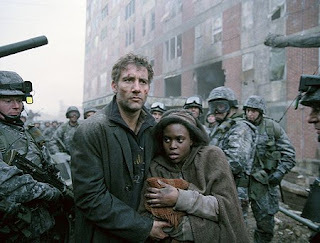 In fact, she’s running WHILST in labour, up stairs and through war zones; she has the baby and then legs it again with good ol’ Clive Owen. And I believed in this story absolutely, despite the misgivings I had of the blind script. So what’s the difference?? For me the facts are important providing they don’t kill of your idea. The minute something gets in the way of my story that’s when I get creative with that particular detail. I think you need to find the right balance between truth and fiction. You make people believe it and they wont care when something isnt accurate. Take all the medical shows as an example, some of them have some obvious problems with details, but we as viewers (for the most part) just go with it. Hmmm, it’s a difficult one and sometimes depends on context, other times character. Context – if jeopardy demands someone does something unlikely, I think that helps. We get so caught up in the drama we forget to check our facts or groan, “As if!” A good example of that is stuff like action movies. There’s no way Harrison Ford would survive jumping down that big river thing in The Fugitive at that height with that much water pounding him. But it’s an amazing stunt so we’re willing to let it go. Character – sometimes we’re so bamboozled by how much we love a character, we are willing to overlook the unlikely. HOUSE is a good example of this. This is, I think, harder to achieve than the context thang. Lucy, research has been incredibly important for my first script. And the Internet has been a godsend — not only for finding articles, photos and YouTube videos but for tracking down obscure books (there are only a few published about the small, now defunct railroad featured in my script). I cannot imagine going back to the days before the Internet! I love Google Map (and similar ones, such as LiveSearch Map) that allow you to zoom in for a bird’s eye view of your setting. I’m currently living a long way from the state where my story takes place and being able to see streets, the river and other topography from my story is ever so helpful. For one part of my story, I needed to hit on a few of the landmarks of the city as the train leaves town. Now, we’re talking about a railroad that doesn’t exist anymore. But I managed to find an article about a walking tour that covers the route and it beautifully gave me what I needed, all in one place. I’ve also found DVDs to be of immense help. For instance, how can you have an old train whistling throughout a script without it becoming a total repetitive bore? Watching a DVD of a steam train from the same region allowed me to hear the nuances of the whistle, and thus come up with different ways to write it in my script. P.S. My poor dictionaries and thesaurus (that I used to adore) have gone moldy from misuse. I find it much faster and more efficient to look up words and definitions on Dictionary.com and Thesaurus.com.